Control provides inputs from; "Backup Light", "Left Turn", "Right Turn", "Brake Light" and "Spare Input". 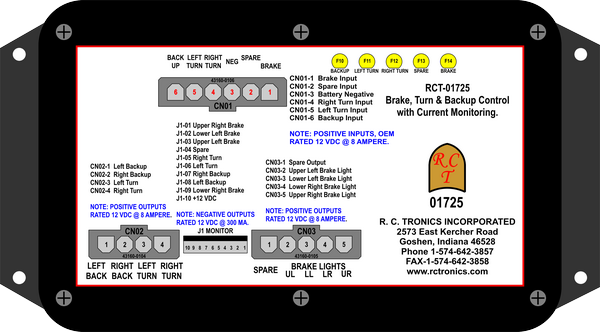 Control outputs; "Backup Light", "Left Turn", "Right Turn", "Brake Lights (4 outputs) and "Spare Output". Current monitioring of all loads will show bulb failure. RCT-01730 Display, is remotely mounted for driver identification of bulb failure.